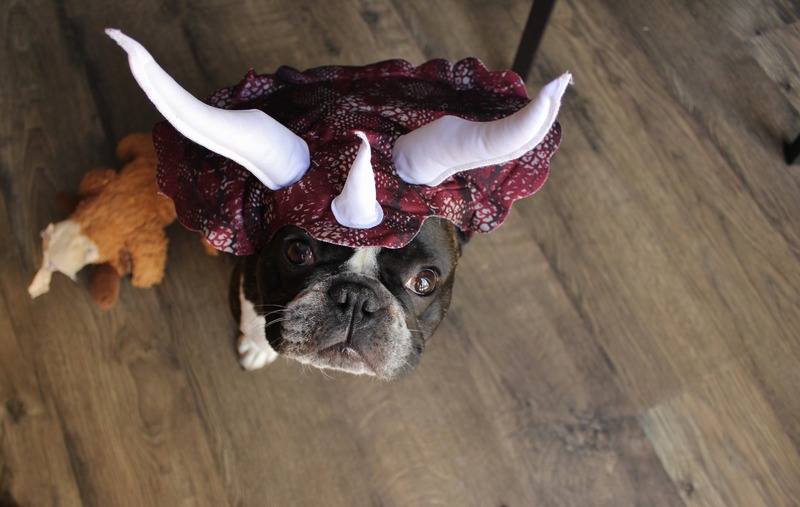 While France may be reluctant to adopt the American tradition of trick-or-treating or even dressing up (although the holiday is believed to be of European origin), that doesn't mean your French Bulldog will have similar resistance. In fact, their small stature and iconic faces are nearly perfect for numerous costumes from burgeoning artists to the little devils they may actually be. Of course, you can always dress them up in a striped shirt and a beret, but for those looking to go beyond their heritage, here are some ideas that won't have them trying to devour the baguette included with their costume. If your little canine companion likes to grumble, consider turning them into a bumble (bee, that is). Thanks to their barrel-like bodies and the buzz of their brachycephalic noises, all you need is a yellow and black striped sweater or fuzzy wrap, plus some wings and antennae to turn them into a sweet-as-honey (or bumble) bee! 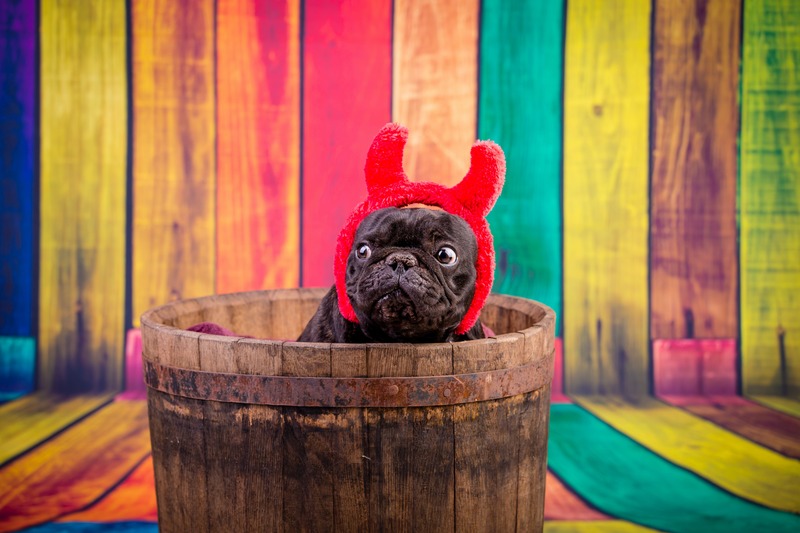 For those who want to embrace their dog's inner evil (or cute representation as such), consider adding some red horns, a bowtie and maybe even a pitchfork to help show the world that your little angel is actually more of a little devil. On Halloween, we'll get you pretty and your little dog too! A pointy hat, fake spiderwebs and even a few creepy crawlies are all you need to prove to others that you plan to spend the day chasing as many treats as you do broomsticks. Your sometimes stinky little friend may be better known for having a bit of de-gas in them, but if you want to paint them in a better light, consider making them a Degas. All you need is a fake little mustache, a beret and some glasses to turn your little moaner into a little Monet. With a perfect mug for the look and a robust figure to match, it doesn't take much to turn your Spike-r into a biker. Dress them in a leather hat and a denim vest or jacket and you'll be well on your way to turning your little furry bloke into the rider of a 2-stroke with convincing noises to boot! Two-four-six-eight, who do we appreciate? 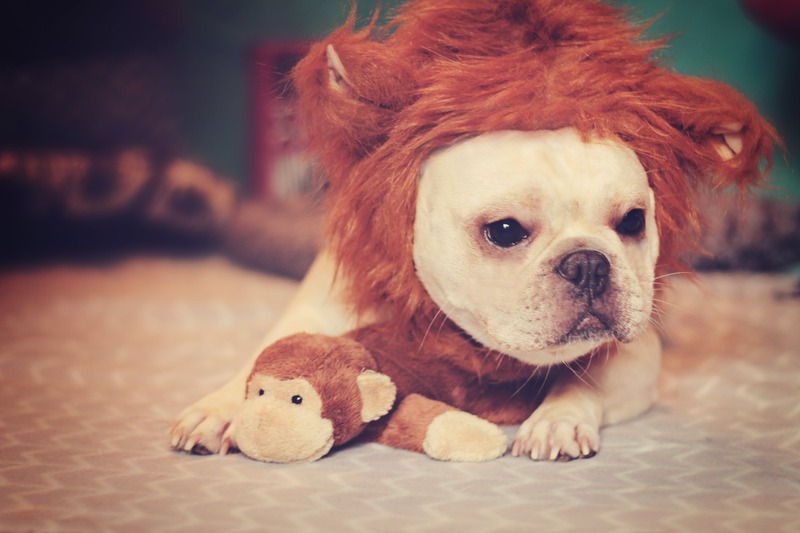 It's dogs in costume! In costume! With the contrast of their unconventional face and figure aside (which really just makes it all the more funny), all you need is a tutu, a lettered sweater and some pom-poms (and curls if you can find them) to turn their ruffs into rah-rahs! While they may have worked some magic on your heart, you can finally show everyone what they're made of. Saddle them up with a pair of sparkly wings and maybe even a little jeweled crown if you want to turn your fairly odd dog into a fairy dog-parent. If you're looking to get sporty this Halloween, turning Spot into a spot-kicker is a great option. With the help of a simple jersey and a soccer ball, you'll make your costume goals by making Scooter a "bone-afied" ball-booter! Up in the sky! It's a bird! It's a plane! No! It's superdog! While their special powers of flying across the room and making dinner disappear instantaneously may not translate to others on a daily basis, dressing them in a cape and suit for Halloween will surely have evil-doers everywhere running for cover (if they're not too busy fawning over their rival's outright adorableness). Halloween is Stewart's favorite holiday - he helps me hand out candy every year. Last year I dressed him up as a lion..my favorite costume yet! This costume was pretty fitting for Lulu's personality. She runs the house, so when I saw the devil horns I had to get them! The kids love dressing Buster up for Halloween..he kept the costume on for a few pictures but managed to shake it off pretty soon after. He makes a pretty cute Stegosaurus though!